GIRLFRIENDS IN GOD is a non-denominational ministry that uses women to encourage and equip other women in their spiritual journey. 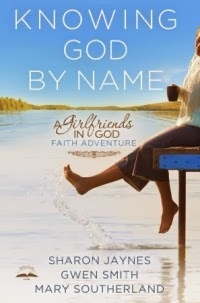 Sharon Jaynes, Gwen Smith, and Mary Southerland are the co-authors of a "girlfriends in God" devotional called KNOWING GOD BY NAME. I thought this was a unique devotional that is a product of some good, Biblical research. The authors take 8 weeks to introduce us to 40 different names for God, and what they each mean. EL ROI means "the God who sees"
EL ELYON means "the most high God"
For 5 days of each of the eight weeks, there is a Scripture reference, a short devotional, and a prayer. Then, on day 6 of each week, there is a time for reflection and going deeper with God. I haven't finished reading the entire book but, what I have read so far has been interesting and thought-provoking. I look forward to reading more. To get a sneak peek, you can download Chapter 1 HERE. Check it out! I received this book free of charge from BLOGGING FOR BOOKS for review purposes. The opinions expressed are my own.